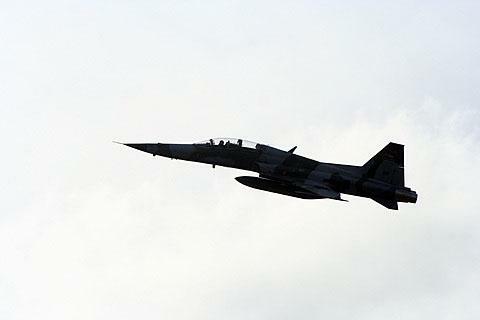 A Kenyan spokesman says jet fighters have killed dozens of al-Qaida-linked militants gathered in southern Somalia, as part of an ongoing effort to force them out of the country. The spokesman, Colonel Cyrus Oguna, told reporters Saturday that at least 60 al-Shabab militants were killed in Friday's airstrikes in the town of Garbaharey in Somalia's Gedo area. He said the military was tipped off about the militants' whereabouts, and that he expects the death toll from the attack will rise. Kenyan forces entered Somalia in October to push back al-Shabab, which controls large sections of southern and central Somalia, and is blamed by Kenya for a series of cross-border kidnappings. In a related development, Britain said Saturday that London believes there is a heightened terrorist threat in Kenya. A Foreign Office statement says Britain believes terrorists may be "in the final stages of planning attacks." On Wednesday, the Kenyan army said the southern Somalia town of Fafadun was seized in an operation that killed three al-Shabab members. A Kenyan spokesman said the dead include a key al-Shabab leader in the Gedo region, Sheikh Hassan Hussein. Al-Shabab is known for enforcing a strict brand of Islam in the areas under its rule. The group has also blocked most international aid workers from accessing parts of Somalia suffering from drought and famine.